High Power(23dbm) 108Mbps Wireless USB 2.0 Adapter. Senao NUB-362 is based on Atheros AR5523 chipset. The USB 2.0 wireless card supporting 802.11b/g (2.4GHz) radio operation. 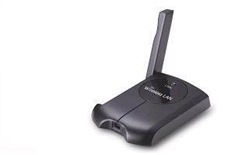 It provides high-speed wireless connection with data rate up to 108Mbps. The shirking dimension, light weight & lower power consumption design can easily integrate into a wide range of OEM/ODM device. NUB-362 has high power and high sensitivity. It can advance your distance and performance.